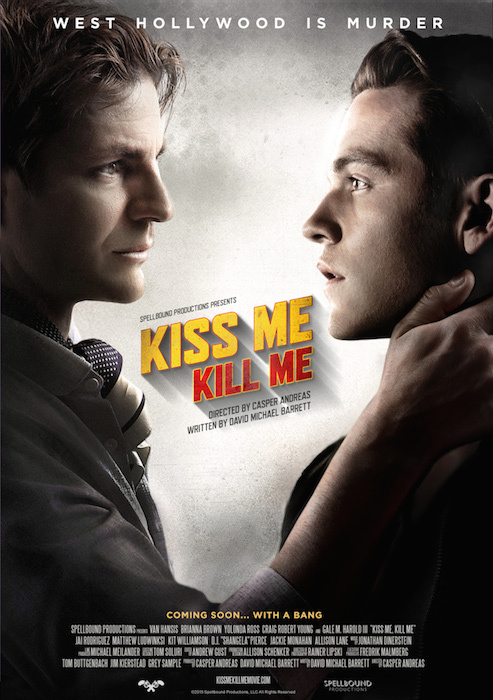 I was one of the lucky ones — I got to attend the “virtual premiere” of the new Casper Andreas film Kiss Me, Kill Me last weekend. Instead of heading the the Windy City to watch the real deal at the Reeling Film Festival — which certainly would have been fun — I got to watch it from the confines of my own living room. Ain’t technology grand! “Coming soon … with a bang” — my vote for best copywriting this year. It was just a fun movie. A very gay take on the old fashioned film noir pot boiler, it was more of an homage than it was a send-up. It didn’t take itself too seriously, then again, it didn’t camp it up too much either. That’s Andreas’ seasoned hand at the tiller. David Michael Barrett’s sneaky story — one switchback turn after another, twisting and turning until the bitter end — and no, I’m not handing out spoilers — was full of surprises and puns and quips; the kind you could imagine Nick and Nora Charles coming up with. I love those old film noir detective movies and pulp paperback stories; smirky gumshoes throwing shade before anyone knew what shade was, thumping the bill of their rakish fedora as they threw the cherry end of a Lucky under their heel and crushed it out, walking out of the frame into the fog. This was like that, only gayer. Much gayer. After their premiere earlier in the week in EastSiders, it was fun to see Van Hansis and Kit Williamson playing opposite each other in wildly different roles. It was also great to see Hansis play off of the always-terrific Gale Harold. Craig Robert Young and Brianna Brown were lovely, too, as were Yolanda Ross and Jai Rodriguez as the detectives assigned to the case. And Jonathan Lisecki should be the store clerk — or snarky best friend — in every film ever. [Stonewall] was directed by a gay man, written by a gay man, with an obvious intent to educate, uplift, and inspire, in this particular political climate, and is still so maddeningly, stultifyingly bungled serves only to show us how ridiculous the concept of a monolithic “gay community” really is. Stonewall at least does that bit of good: it illustrates how systems of privilege and prejudice within a minority can be just as pervasive and ugly as anything imposed from the outside. And that’s an outrage. So how long until someone throws a brick through the screen? Well, sorry, Richard. You chose the wrong gay movie to see. My choice was well-acted, well-directed, easy on the eyes and interesting. See it next time you’re looking for a good time at the cinema. This entry was posted in Gay, Independent Film, LGBT, Movies and tagged Gale Harold, gay, indie film, LGBT, movies, van hansis. Bookmark the permalink.